The event of the Final Judgement has been proclaimed from ancient times. When the Prophet Daniel was held captive in Babylon, he had an apocalyptic vision where he saw a throne, on which sat the "Ancient of Days", namely the pre-eternal God, clothed in garments white as snow, while the hairs of His head were pure white like wool. His throne and the wheels of His throne emitted flames of fire. And from the throne flowed a fiery river. An innumerable amount of Angels attended Him and stood around Him. Then the books were opened and judgement took place (Dan. 7:9-10). This event is completely affirmed by our Lord, when the tribes of the earth shall see the Son of Man coming "on the clouds of heaven with power and great glory," and He will sit on the throne of His glory" to judge "all nations" (Matt. 24:30; 25:31-32). On the Sunday of Meatfare the Church brings these things to our remembrance. The beautiful hymns describe the unusual feelings that will move us, when "the thrones will be set, the books will be opened, actions will rebuke, and the hidden things will be revealed." When there will flow "a fiery river before the judgement seat" of the Judge, that will overwhelm everyone, both the good and the wicked, in the flood of its fire. What exactly is the river of fire? Some think that the river of fire is the fire of hell, by which God will punish the wicked. But God does not take revenge, does not hate, does not punish anyone. God only loves (1 Jn. 4:16). And the river of fire is precisely this infinite love of God, which will embrace everyone without distinction. 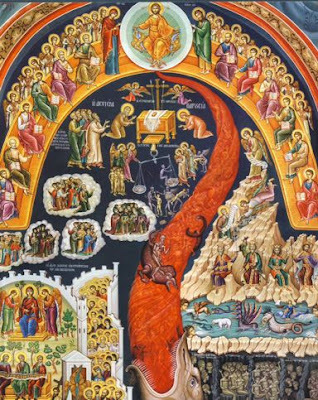 Paradise or hell will be what each of us will experience within this river of the infinite love of God. It will be the way each of us personally accepts God's love. As to how we receive the love of God is purely on our own terms. It depends only on our freedom, our personal free will. Our attitude to God, whether we will be friends or enemies, is something for us to decide, and it will be eternal. God, absolutely respecting our choice, cannot change it. He cannot remove our freedom. Paradise and hell depends only on us. It is not a matter for God. And it is made eternal by our final and irrevocable choice. Otherwise, if eternal hell was a punishment from God, it would reveal that God is immeasurably evil, and especially dangerous to us. However at the Second Coming God will not punish, but He will permeate everything with the light of love, which like a river of fire will proceed from His throne. The books will be opened, namely, everything will be brought to light and in the fire they will become translucent. Our hearts will clearly show our intent. What will be hidden within them? Love or hate? If there is love in our hearts, our encounter with the divine river of love will be joy and paradise. If within our heart reigns hate, then when the love of God tenderly embraces us as a fiery river, we will feel unbearable misery and hell. The fire makes gold shiny and bright, but it burns brushwood and wood (1 Cor. 3:12-15). What will we feel in the fire of divine love? Will we sparkle like gold, or will we be burned?